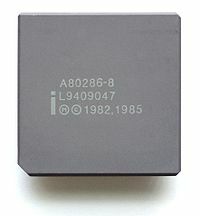 The Intel 80286 processor is introduced in 6 and 8 MHz versions. It was employed for the IBM PC/AT, introduced in 1984, and then widely used in most PC/AT compatible computers until the early 1990s. The “286”, as it was most commonly called, paved the way for the PC (and now Macintosh) as we know it today.